We have found that the medium size buses often offer the greatest value of all of the buses we sell. When using a “cost per passenger” model, the 26 passenger bus offers a lower price point than the standard 15 passenger bus. For just a negligible amount more, customers can get into a larger bus that carries 11 more people which reduces the cost per passenger. The offers more “bang for your bus” than a small bus does. 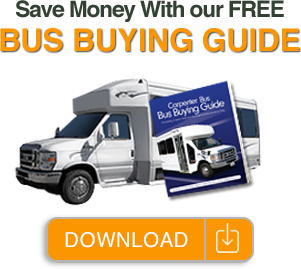 One issue that might persuade a buyer to buy a smaller bus instead of a medium bus is the licensing requirements. As a rule of Federal law, any bus that carries 16 passengers or more (including the driver) requires the driver to carry a Commercial Drivers License (CDL.) This requires the organization to have drivers with a CDL to use the bus. If your organization has drivers with a CDL, then your best option might be one of the medium buses for sale in our inventory.